The Brothers’ are on a roll! Click the pic to check ’em out! National Hamburger Festival: Judging the Burgers! 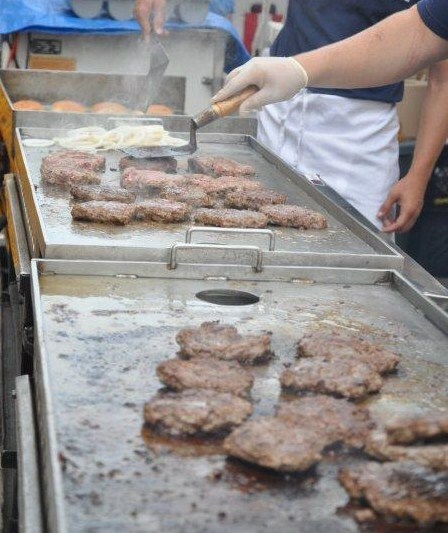 There were burgers as far as the eye could see — award winning burgers, national chain burgers, local Akron restaurants, and even some restaurants from the Mahoning Valley were represented. It was a burger fanatics dream come true — the National Hamburger Festival (NHF). The festival has been held at Lock 3 in Akron for the past five years, with proceeds going to the Akron Children’s Hospital. With over 20 restaurants competing for the 2010 NHF Awards, there were many different kinds of burgers to sample. The MVBRB took the trip to Akron to see what the Festival was all about. There was a little bit of everything — and plenty of burgers. There was a great time to be had by everyone who went. I tried three different burgers and thought this competition was wide open because they all tasted so good. Restaurants were required to make 2 serving sizes of burgers available – the full price and a half price version. I thought it was great to have the opportunity to sample the different burgers. The half portions made it easier to taste more burgers. I would have preferred more local restaurants rather than have the National chains represented, but that’s what makes competition fun. It was great to see Martini Brothers (Girard) and O’Donold’s (Austintown) represent our Valley in the competition. After trying the burgers, you were able to end the day with some kettle korn, ice cream, funnel cakes and even cheesecake on a stick. Any time the burger is the center of an event, it’s guaranteed to be a great time. The main event is the burger competition, where all the restaurants compete to win awards in five categories. The restaurants can enter up to two burgers. 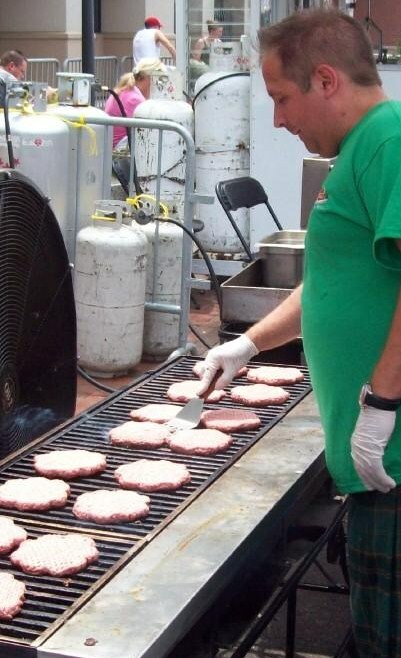 Christian Rinehart flippin’ some of those great O’Donold’s burgers! (Two restaurants the MVBRB reviewed took home awards; Martini Bros (1st Creative and 3rd Best Beacon), and Steel Trolley Diner (1st Toppings/Special Sauce). Other events were the Miss Hamburger Pageant; the Baby Burger Contest; Bobbing for Burgers; and the Ohio Hamburger Eating Championship. There was also live music and a kids zone.